Although they are usually hard to find, fossils are not hard to see. What is surprising to many first-time fossil hunters is how life-like a fossilized animal or plant appears. There is no need to use your imagination to spot fossils in the ground, as if conjuring animal-shaped clouds in the sky. Biological organisms are symmetrical, mathematical, patterned, and in most cases they fossilize having retained much of the appearance they had in life, even if they become flat and resemble prehistoric roadkill after millions of years of geologic pressure. Depending on where one looks, fossils are sometimes harder to track than trophy game, yet in a few exceptional places, like the badlands around Lake Turkana, Kenya, it is difficult to step without crushing fossil fragments beneath your boots (Figure 3.1). Fossils are the mineralized remains of once living organisms. 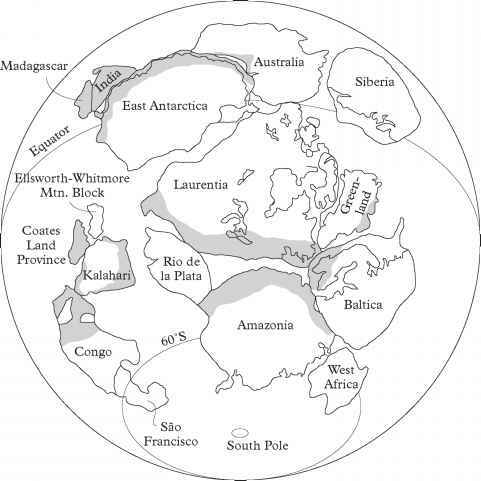 Mineralization of organic material occurs through ground water replacement or through the leeching of minerals between the fossils and the surrounding earth. Chemicals will often replace the inorganic elements in bones and teeth as well. Fossils can be formed from things like bones, teeth, plants, wood, hair, feathers, footprints (like the bipedal walkway at Laetoli, Tanzania, about 3.6 Mya), tracks, trails, body impressions, feces, and vomit. Soft tissue, like skin, rarely fossilizes, but it is possible and it usually takes the form of an impression or "trace fossil." Figure 3.1 Paleoanthropologists survey the badlands of Koobi Fora, Kenya to search for fossils and sites. Photograph by Holly Dunsworth. confused with "living fossils," which are organisms that have not changed much through time, like crocodiles that look very much like fossils of their 80-million-year-old ancestors. Fossils are often hard to find because of the slim chance that a dead organism actually gets preserved and then the even slimmer chance that anyone will actually find it millions of years later (Figure 3.2). If a person wants to become a fossil, they need to make sure they are buried quickly before scavengers chew up and scatter their bones. They should plan to die near a river, pond, or lake or amongst sand dunes where water and air are constantly building up sediment. The sediment cannot be too acidic or contain too many microorganisms since these promote skeletal degradation. Very dry, arid places are best, but volcanic ash burial is the best scenario since, depending on the geochemistry of the ejected sediment, a person could meet the requirements of becoming a fossil, plus have the potential to be dated well by geochronology. Of course, the final requirement of becoming a fossil is to actually be discovered by someone, so someone would need to draw a map of their whereabouts using symbols that will be understood in a million years (when contemporary languages will have evolved beyond recognition), on a material that will also be preserved for eons. 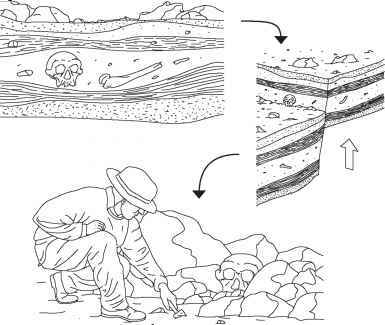 Figure 3.2 The Life of a Fossil. A H. erectus dies on the savannah and may or may not be devoured by scavengers like carnivores and birds. Next, particularly if the environment is an arid one, the body will decompose to leave just the skeleton behind and the bones may get scattered by animals and the elements. Through time, the bones get buried naturally by sediment carried by water or air. Geochemical processes and pressure under the ground turn the bone into rock. Then geologic processes like faulting (shown here) or simple erosion can expose the fossil at the surface for a paleontologist to discover. The paleontologist would excavate around the spot in order to find any other remains of the skeleton that are, hopefully, preserved there. Illustration by Jeff Dixon.